PointRoll also found that nearly 68% of in-stream video ads were watched 100% through to completion vs. 40% for mobile and nearly 23% for rich media. Interactive in-stream ads performed better than standard in-stream ads in both click-through rate and completion. Of 11 different types of sites measured, Kids and Family sites drove the best click-through rate for in-stream video at 1.9%. 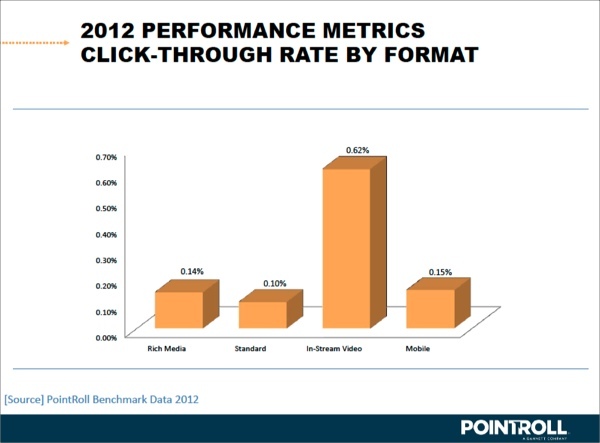 In-stream video ads that ran on business and finance sites had a 77% rate of 100% completion, the highest of all sites. The benchmark study is based on 2 billion video ads impressions and 55 billion rich media impressions. It is available here.